HOUSTON, April 11, 2019 (GLOBE NEWSWIRE) -- Sharps Compliance, Inc. (Nasdaq: SMED), a nationwide provider of management services for medical waste and unused medication, has properly collected, processed, and treated more than 3.2 million pounds of unused ultimate-user medications since 2009. This milestone, achieved primarily through the use of its MedSafe® and TakeAway Medication Recovery System™ Envelopes coincides with the Drug Enforcement Administration’s 17th “National Prescription Drug Take Back Day” on April 27, 2019. Since 2009, Sharps has sold 3.6 million TakeAway Medication Recovery System Envelopes through participating pharmacies and on its website. To date, Sharps’ MedSafe and TakeAway Medication Recovery System Envelopes have facilitated the proper destruction of more than 3.2 million pounds of unused medications. Sharps Compliance is committed to helping communities and citizens dispose of unused medications to combat the growing epidemic of prescription drug abuse and accidental poisonings throughout the year. The company has been a longtime supporter of the DEA drug take back event, which occurs annually in April and October. Additionally, Sharps Compliance announces that it will attend the Rx Drug Abuse & Heroin Summit, the largest annual conference addressing the opioid crisis. This conference, which focuses on treatment and prevention, will take place in Atlanta, GA on April 22-25 and represents an excellent opportunity to increase awareness of the important role that proper disposal plays in helping solve the opioid crisis. According to the National Institute on Drug Abuse, drug overdoses, including those from opioids and illegal drugs, cost the United States more than 70,200 lives in 2017. Drug-related deaths increased from “8,048 in 1999 to 47,600 in 2017.” Most of these deaths were among males. Prevention and education are key components for fighting the opioid crisis. JAMA Surgery reported that as many as 92% of patients don’t finish their painkillers, and fewer than 10% safely dispose of the leftover pills. A recent study by Purdue Pharma found that patients who received education about the importance of safe disposal were approximately three times more likely to dispose of their unused medications. Sharps Compliance has placed approximately 3,000 MedSafe collection receptacles in retail and hospital pharmacies and long-term care, drug treatment, and law enforcement facilities since the release of the updated DEA disposal regulations in 2014. To date, customers have returned over 28,000 inner liners with over 1.2 million pounds of unused medications. Sharps has sold nearly 3.6 million TakeAway Medication Recovery Envelopes since 2009. MedSafe is an ultimate-user unused medication collection and disposal system, which accepts controlled (Schedules II-V) and non-controlled medicines. It combines industry-leading secure receptacles with the reverse distribution, destruction, and reporting capabilities of Sharps Compliance via our patented inner liner system. The patent-pending MedSafe medication disposal program operates under and is fully-compliant with the October 2014 DEA rules and regulations. The TakeAway Envelopes are available at participating pharmacies and on the Company’s website. Customers can simply purchase a USPS postage-paid TakeAway Envelope, place their unused medications in the envelope, and drop it in any mailbox. 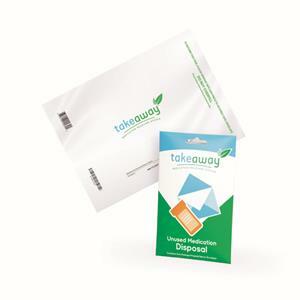 The TakeAway Envelope is specially designed for the proper disposal, transportation, and treatment of all drugs, including controlled substances. Local and federal governments, as well as the private sector, have stepped up to provide the envelopes to communities and citizens to help with medication disposal. Sharps Compliance partners with public and private entities to address the growing problem of opioid abuse, working closely with federal agencies, such as the Department of Veterans Affairs and the Department of Defense as well as state governments, like Montana and North Dakota. Sharps also works with private businesses, such as independent and chain pharmacies, long-term care facilities, hospitals and healthcare systems, and narcotic treatment facilities. Sharps Compliance applauds the efforts of these organizations stepping up to help their communities. Headquartered in Houston, Texas, Sharps Compliance is a leading full-service national provider of comprehensive waste management services, including medical, pharmaceutical, and hazardous. Its key markets include healthcare facilities, pharmaceutical manufacturers, home healthcare providers, assisted living/long-term care, surgery centers, retail pharmacies and clinics, and the professional market, which is comprised of physicians, dentists, and veterinary practices. Sharps also provides two simple solutions for safe and easy disposal of unused medications: MedSafe collection receptacles and TakeAway Medication Recovery System Envelopes. More information on Sharps Compliance and its products can be found on its website at www.sharpsinc.com.